Bodyline – the tactic that changed the game | The International Cricket Hall of Fame. Sometimes it doesn’t pay to be the best at something. It draws attention to you, it makes people talk about you and it often makes you a target. In 1932 aged just 25 Don Bradman found himself in this situation. The English were not happy about his incredible skill with a cricket bat; his batting average for the 1930 Australian tour of England was 139.14, he seemed unbeatable and he was so young, to the English this appeared to be an insurmountable problem. So Bodyline was born, or ‘Fast Leg Theory’ as the English called it. This incredible period of cricket changed the face of the game forever and very nearly caused a political crisis between Australia and England. And all because Don Bradman was so good at playing cricket. It’s hard to believe that Bodyline – just 22 matches between October 1932 and March 1933 changed the face of cricket forever and remains one of the most important events in cricket history. 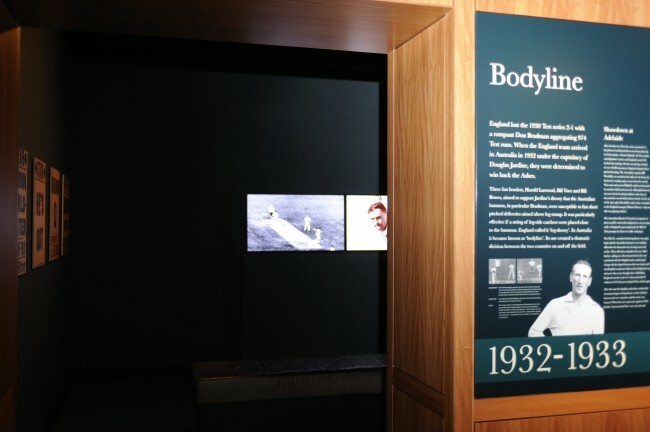 So important is this period that the new Bradman Gallery at the International Cricket Hall of Fame features a dedicated Bodyline Theatre that screens a short video presentation of the Bodyline episode. Aimed to educate children the video is a Monty-Pythonesque mixture of animation, old news footage, radio commentary and voice-over. It’s a compelling, entertaining and educational piece that many visitors have stayed for a second viewing of. “The Bodyline Theatre marks the entry point to the new Bradman Gallery, it’s a fitting introduction to the incredible skill of Sir Donald Bradman and also the impact that sport has socially, politically and often personally.” Said Bradman Foundation Curator David Wells. If the fast bowler is permitted to bump balls at the batsman to unnerve him why shouldn’t the unnerved batsman be allowed to bash bats at the bowler? “We’re finding that visitors are naturally drawn to the Bodyline Theatre and will often stay to view the video several times over. The impact of the tactic on the game, players and society at the time was just so enormous.” continued David Wells. During Bodyline Don Bradman’s batting average was reduced the lowest of all the eleven Test series he played at just 56.57. The NSW Minister for Sport and Recreation, Graham Annesley officially opened the new Bradman Gallery on November 26.